Do we need more aphorisms like a hole in the bed? 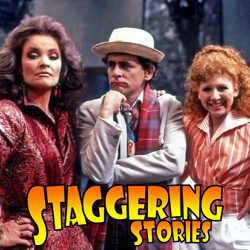 Yes, Staggering Stories Podcast 312: Wigs and the Rani is now available! Doctor Who: Time and the Rani. Sounds of Thunder Annual 2019. Plus, as ever, lots of news (Doctor Who, Game of Thrones prequel, dead Rimmers and more). More madness than wanting to impersonate Melanie Bush.